Words are fine and dandy, but there’s really one way to determine whether or not your clothing properly fits: trying it on. Are you wearing a button-up shirt right now? If not, we’ll wait. Once you’re ready, follow the tests below to see how your shirt fares. Disclaimer: These rules are just "standards"—and no one has a "standard" body. Ultimately, the most important indicator of fit is how clothing looks and feels on you. Finding a fit that's right for you is more important than following the rules to a T.
A collar should not be too tight around the neck (left), too loose (center), but fit just closely enough to accomadate two of your ingers (right). Determining whether or not your collar fits requires two fingers. Just button your shirt to the very top, then see if you can comfortably fit two digits (we recommend the index and the middle) in between the collar and your neck. You shouldn’t have to force your fingers in to do this, but they should still feel snug. Ideally, the collar should be comfortable but close-fitting enough to stand straight all day long. 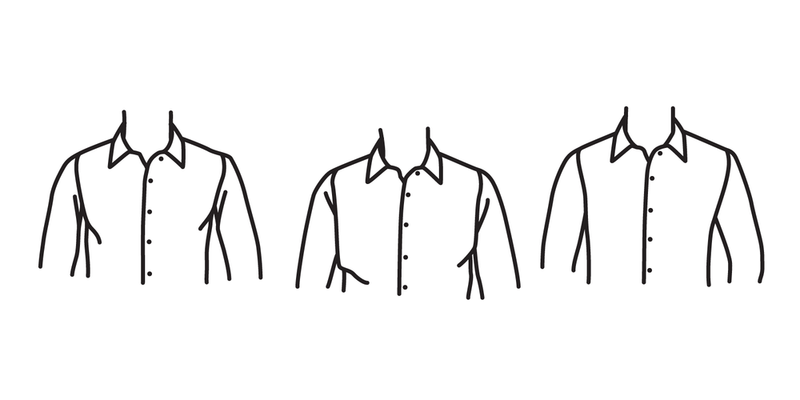 The seams of the shirt should not end before your shoulders (left), or after your shoulders (center), but should align with them (right). Look at your shoulders—not the shoulders of your shirt, but your actual, real-life shoulders. Do your shoulder bones line up with the shoulder seams of your shirt? If the shoulder and shoulder seams align, you’ll be treated with a more comfortable fit and a far greater range of motion than if the shoulders were off. The chest of the shirt should not be so tight that it strains buttons (left), and should not be so wide that it loses shape (center). It should conform to the shape of your body (right). Finding the right chest fit is a two-parter. First, consider whether or not your shirt makes you look like a box (or if you’re more nautically minded, a wind sail). If it doesn’t, that means it’s not too big. Great. Now proceed to round two: assume a resting position and keep your arms down. The buttons of the shirt should fall flat on the chest, without any puckering or strain. Finally, shake the hands of an invisible stranger: if your buttons don’t pucker or strain during this action either, you’re in the clear. The armhole should not be so high at to pull fabric (left), but it should not be so low as to appear baggy (center). It should leave only a quarter to a half-inch of fabric (right). You want the armhole to be as close-fitting as possible without being uncomfortable: a higher armhole will give you better freedom of movement, and make for an all-around cleaner look. There should be a quarter to a half-inch of excess fabric around the armhole, but no more. That way you avoid the dreaded “flying squirrel” effect. The sleeve should not be so short as to stop before your wrist (left), but it should not be so long as to extend past the base of the thumb (center). It should end just as the base of the thumb begins (right). Make a bicep curl. See if you can pinch about a half-inch of fabric around your bicep. If you can’t, the shirt is too small. If you’re getting much more than a half-inch, your shirt is too large. Next, see if you can slip one to two fingers into your sleeve cuff without touching any fabric. If you’re unable to, the cuff is too tight. Your sleeve shouldn't stop before your wrist, but it shouldn't be grazing your knuckles, either. Ideally, the sleeve will end just below the base of the thumb. The best way to investigate length is by slipping on a blazer or suit jacket that fits you well. A quarter inch to a half inch of your shirt cuff should be poking out under the sleeve of your jacket. Trust us, it looks better this way. The midsection of your shirt shouldn't be so tight that it causes buttons to strain (left), but it shouldn't be so loose that it bags out around the sides (center). There should be just 1-2 inches of excess fabric on either side (right). When it comes to the midsection, there’s no “gold standard.” Some men like a closer fit, and others are flattered by a slightly fuller cut. But you shouldn’t be able to grasp more than an inch or two of extra material on either side of your midsection. On the other hand, your shirt should never be so tight that the buttons around your midsection are straining. Just like the chest, make sure the buttons fall flat when seated. A shirt meant to be tucked in shouldn't be so short that it does not cover the seat (left), but it should not be so long that it extends well below it (center). It should just cover the seat (right). First, you must ask yourself one of life’s great questions: will you be wearing this shirt tucked or untucked? If you’re wearing it tucked, it should cover your entire seat. If you’re going to go the untucked route, it only needs to cover half your seat.